Canister filters are used by fish enthusiasts who need superior mechanical, biological and chemical filtration in large aquariums that house their fish. When you buy a canister filter, you’ll notice that its body is a lot larger than most other power filters; this large body allows the filter to hold extra media to filter your water. Depending on the model that you buy, your canister filter will have one to three media baskets inside of its body, and each of these baskets can hold different filter media types. Remember, your canister filter is something that you do not want to go cheap on. How Were These Filters Chosen? Canister filters work by channeling water out of your aquarium and through their body; this water is pushed through the filter media inside of the canister, and this effectively removes impurities from the water. You have a couple of choices when it comes to the direction of liquid flow in your canister filter; there are top-to-bottom, bottom-to-top, center-out, back-to-front and outside-in filters. The flow of water changes based on the brand or model that you choose, but they all work to effectively clean your water. Different types of filter media will clean specific substances in your aquarium; you can buy filters that offer biological, mechanical or chemical filtration. One of the great things about canister filters is that you have slots for more than one type of media, so you can pick and choose what you filter out of your aquarium’s water. Canister filters are sealed systems, so they use an electric pump to move water back into your aquarium after it is filtered. Most systems include this pump, but some inexpensive models require you to buy an external pump separately. Canister filters come in different shapes and sizes, and they can be used for both saltwater and freshwater aquariums. The great thing about these filters is that they are very flexible; you can use different media types to create a custom filtration system for your aquarium. You can add accessories like diatomic sleeves, sponges and extra rings for additional filtering, and these filters can be tweaked to be used in almost any environment. We have compiled information from all over the web and found the best fish tank filter for every situation, as well as best aquarium filters. The Fluval 406 is an upgraded version of Fluval’s famous 405 canisters; the company added upgrades like a bio-foam impeller, strong lift lock caps and increased hydraulic performance to make water filtration easier for both fresh and saltwater tanks. The Fluval 406 uses Aqua-Stop valves to make hooking up hoses easier; you no longer have to muscle hoses onto the filter’s valves. It uses lift-lock clamps to make opening and cleaning the unit easy, and its multiple filtration baskets come stocked with chemical, biological and mechanical media; when this unit ships, it comes with everything you need to keep up a top-of-the-line aquarium. The Fluval 406 is a powerhouse filter that runs extremely quietly. If you have a large tank that needs to be filtered, you can depend on this unit’s multiple filtration levels to clean out biological and chemical impurities from your water. The manufacturers included lift lock clamps for easy maintenance, and the unit’s strong engine powers through 155 gallons of water per hour. This is a great tank for both fresh and saltwater aquariums; it cleans out impurities, and it runs without making a sound. If you need a strong and dependable unit, then the Fluval 406 is perfect for your tank. The Eheim Classic External Canister Filter is a unit that uses high-quality components to guarantee that your aquarium stays as clean as possible; these components provide reliable filtration at a low cost to the consumer. This model has been on the market for over 30 years, and it’s considered a classic for a reason; it has proven itself to be quiet, dependable and efficient millions of times over. The Eheim Classic ships with an elastic sealing ring, built-in pump, inlet pipe, hose and installation accessories. Eheim really delivers quality and dependability with this unit, and they have managed to keep it affordable. Affordability and dependability is why this unit is considered one of the best canister filters on the market today. The Eheim Classic is a reliable filter that will last you for years; it has a completely silent motor, and all the filter media fits tightly into the canister. We like this unit’s bottom-to-top flow rate, and there’s virtually no bypass of the filter media, so it produces excellent water quality. It’s a classic unit, and it always scores high on all canister filter reviews. The Eheim Classic has proven itself to be the best, and we feel that this filter far exceeds our expectations. When you buy this filter, you can look forward to a lifetime of dependability, quiet and trouble-free service, and you can get this all at an affordable price. The Fluval 206 uses a filtration system and a quiet engine to quickly filter your aquarium, and it does this with less maintenance than other tanks on the market today. This filter makes keeping fish easy, and when something is easy, it makes it more enjoyable. The unit’s improved hydraulic performance means that this filter has an excellent flow rate, and this flow produces cleaner and healthier water for your fish. The filter’s engine has a patented Bio-Foam Sound Dampening Impeller that reduce the unit’s sound output by up to 15 percent. The cover of the unit was designed to make this unit strong, and the user-friendly features make this unit a pleasure to use. When you get a hold of the Fluval 206, you immediately notice the high-quality materials that it is built out of; it’s a very solid unit, and it’s built to last. Water moves through the three media baskets in this unit, and you can put whatever type of filter media you want inside of them. When you order this unit, you get everything that you need to get started; it ships with foam, ceramic bio-media and carbon pouches. We really like this unit; it’s well designed, quiet and it does a great job of filtering water. The API Filstar XP-M is a powerful and low-maintenance filter that uses an anti-airlock system to operate silently and consistently. When you plug this unit in, you never have to deal with the sound of a whirring engine, and with the unit’s three-year warranty, you can be confident that this filter will clean your water for a substantial amount of time. This filter comes with media baskets that can be used for chemical or biological filtration, and the filter has a priming mechanism, so it starts up easily every time that you use it. The design of this API unit makes it one of the best canister filters on the market; it’s built to be tough and reliable, and its solid construction guarantees trouble-free and quiet operation. If you need effective filtering, strong flow rates and easy maintenance, then the API Filstar is the filter for you. 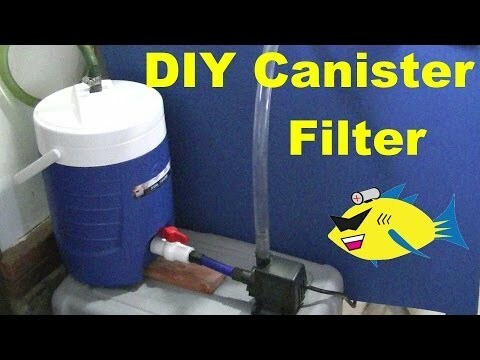 You really can’t go wrong with this filter; it’s aesthetically pleasing, and it cleans your aquarium water efficiently. It does this without making a sound. The filter’s quiet operation is amazing when you consider the fact that it goes through about 300 gallons of water per hour. If you need crystal clear water from an easy-to-maintain filter, then the API Filstar will be perfect for you. We really think that this is one of the best filters on the market. We’re not exaggerating when we say that this filter doesn’t make any noise. It’s very easy to maintain and clean, and you can change the unit’s filter pads in about 10 minutes; we wholeheartedly recommend this canister filter. The Emperor 400 Pro Series filter is perfect for both seasoned aquarium owners and people who are just getting into the hobby; this unit makes filtration easy, and it can filter tanks up to 80 gallons with its 400 gallon per hour pump. If you need an effective filtration system that can properly support the bio-load created by your fish, then this unit is right up your alley. It works with saltwater and freshwater aquariums, and it lowers your tank’s ammonia and toxicity levels; it’s perfect for people who want to keep sensitive fish. The Emperor 400 delivers professional-grade filtration in a unit that is easy to use and maintain. We really like this filter; it’s very easy to setup, and it runs without much maintenance. We did notice that the engine runs a little louder than other units, but it’s still very quiet; we don’t think that it’s loud enough to cause a disturbance. This powerful unit uses a three-stage filtration system, and it can get through 400 gallons of water per hour. It comes with extra media slots and a two-pump design to guarantee that your water stays sparkling clean and clear. If you have a large tank with sensitive fish, then this filter is perfect for your needs. It’s easy to put together, and the unit doesn’t need very much maintenance. It’s a high-quality unit that does wonders at filtering out biological and chemical impurities from your aquarium’s water. The Cascade 1000 Canister Filter offers heavy-duty filtration at an affordable price. This external filter can be used in aquariums that are up to 100 gallons, and the powerful pump in this unit filters through more than 265 gallons of water per hour. When combined with the fact that this filter provides biological and chemical filtration, the consumer ends up with crystal clear water every time that they use this filter. The Cascade 1000 uses a floss pad and activated carbon to remove impurities from your aquarium, and its absorbent sponge gives your filter a large surface area for biological filtration; it promotes good bacteria growth to remove waste, food, nitrates and ammonia. This durable filter is made of high-quality materials, so it’s perfect for people who need a low-maintenance unit. The Cascade 1000 is a great filter; it’s easy to setup, and it has an easy priming mechanism that takes a couple of pumps to get going. This filter does a great job in tanks up to 100 gallons, and it always produces crystal clear water without making a bunch of noise. The pads inside of this unit make changing the filter media simple, and the unit works great for people who don’t like to spend a lot of time on maintenance. This filter is great for both freshwater and saltwater tanks. The unit promotes good bacteria growth, and it filters out chemical and biological impurities. If you have a large tank with sensitive fish, then this unit will work perfectly for you. The AquaClear 110 is one of the most versatile hang-on canister filters on the market today; the canister’s unique design allows for extra filter media storage, and it has the longest media to water contact times in the industry. This contact means that your water is always filtered when flowing back into your tank, and the unit’s flow control reduces flow without harming the motor or impeller inside of the unit. The AquaClear filter system gives you the opportunity to stack filter media based on your preferences, and you never have to worry about overloading the media; the unit’s large chamber can handle it. This powerful and quiet filter saves you a lot of money in the long-run. You don’t have to buy specialized pads when replacing the filter media; the foam pad on this unit removes dirt from your water. You simply clean the sponge every couple of weeks, and you’ll never have to buy additional pads for this unit. This is one of the main reasons why this unit ranks so well in all canister filter reviews. We like this unit’s output and efficiency, and it can be used in tanks that are up to 110 gallons; this durable unit lets you filter your water based on your preferences, and it comes in an affordable package that includes everything that you’ll need to get started with your tank. The Fluval G6 is a powerful, unique and stylish canister filter with a cool-blue display; when you look at this unit, your perception of what filtration units should look like will instantly change. This unit looks like a piece of high-tech machinery, and it functions just as well as it looks. This modern unit adds to your aquarium’s aesthetics; you can be proud to display the Fluval G6. The Fluval’s HydroTech monitoring system uses an internal sensor to check filter performance, water parameters and cleaning intervals. This sensor does it all for you, so you know exactly what is going on inside of your aquarium at all times. This high-tech gadget is the future of canister filters. If you’re spending a lot of money on your tank, then you might as well get this filter. The initial price may be a little high, but when you consider all the special features that come included with this unit, it really doesn’t cost that much. This unit will last you forever, so the price of it really isn’t that bad. If you want a top-of-the-line filter that utilizes the latest in technology, then you’ll love the Fluval G6. This filter reminds us of a high-class luxury car. It has tons of features, and its internal computer system monitors your tank and water consistently. 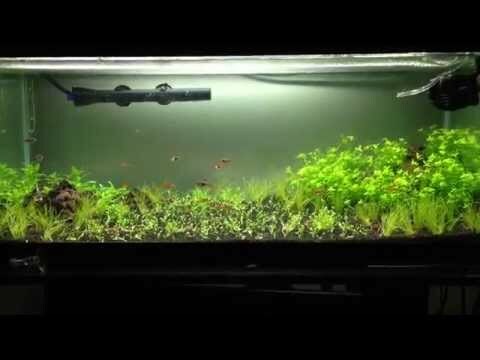 This makes taking care of your aquarium fun and easy, and it does it in an aesthetically pleasing way. The Fluval G3 is a smaller version of the Fluval G6; it has all the functionality of the bigger unit, but it’s made for smaller tanks. This unit looks more like a computer than a filter; it has a cool backlit display that shows you how much water it’s filtering, your maintenance schedule and filter performance. This handy feature makes taking care of your aquarium a breeze, and the stylish unit looks like an expensive piece of electronic equipment, so it adds a certain amount of style to your aquarium and its surrounding areas. This filter, much like the G6, is leading the pack when it comes to canister filter technology. We love the backlit display; it gives you a lot of insight into what is going on inside of your tank. This version is meant for smaller tanks, but it still has a powerful pump that quickly clears your water without making a sound. We really like this unit. It looks cool, and it works very well. This filter looks great on your tank, and it uses technology to make taking care of your aquarium an easy task. We took a lot of time looking at many different canister filters to try to figure out which ones provided the best value. We looked at things like convenience, cost and durability, and then we took our top picks and looked at them even more closely. We really feel like the units that we reviewed here are the best on the market today; they offer great value, are easy to maintain and they’ll last you for years to come. When choosing your canister filter, you need to factor in the size of your tank, the type of fish you have, the size of your fish and the amount of time you want to spend on maintenance. Most people know that they need to consider the size of their tank and fish, but when reading canister filter reviews, they often forget about maintenance. Every filter need maintenance, but some need more than others. You need to buy a filter that you can maintain properly; if you don’t, the system becomes ineffective, and your fish suffer. Therefore, we feel that maintenance is one of the most important factors to consider when buying your new filter. The great thing about the best canister filters is that you can be rather lazy about maintaining them without many problems; the large water capacity and multiple filter media inside of them allow you to filter water more effectively, and they can be left alone for longer than other filter types. Check out this short video that describes the pros and cons of each filter type – HOB and Canister. Q:What’s the best canister filter for a saltwater aquarium? A: All of the filters that we reviewed work well in saltwater environments, but when you use a canister filter in this type of aquarium, you need to be diligent about cleaning it. Make sure to clean the filter once every month; most people do it when they change the water in their tank. 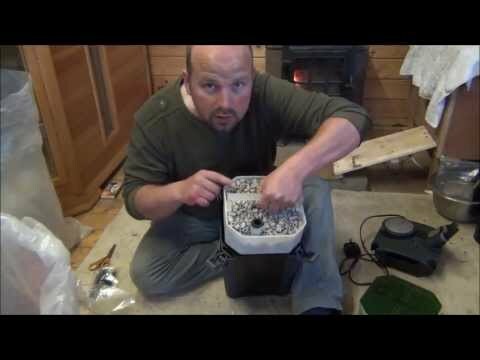 Q: What’s the best canister filter for freshwater? A: All of the filter tanks we reviewed work very well in freshwater environments. It’s hard to say which one is the best; they all offer pros and cons which make them better or worse for certain people. Make sure to read our canister filter reviews; they’ll help you figure out which filter fulfills your aquarium’s needs. Q: Is there anything I should be aware of when it comes to canister filters? A: If you maintain your canister filter properly, it’ll be one of the most efficient filters that you’ve ever had. When you use one of these canister filters, you have the option to change the filter media based on your needs and preferences; this gives you the ability to customize your tank, and it allows you to run your filter with less maintenance. Canister filters are more efficient than power filters; water is forced through the filter media, and it never flows around it. This means that your water is always crystal clear, and you can be sure that you aren’t pumping harmful chemicals or biological agents back into your tank. Q: What’s the best way to choose which canister filter will work for me? A: We feel that knowing what you are buying is important when choosing your filter, and that’s why we recommend reading canister filter reviews that discuss the product you plan on purchasing. When you read canister filter reviews from real people, you can figure out a unit’s strengths and weaknesses, so you’ll know exactly what you are getting. Everyone has different needs, and some units meet these needs better than others. If you’re smart about your canister filter choice, you’ll pick a unit that has the strengths that you need. Canister filters are great for people who need performance from units that don’t take long to maintain. The best canister filters are flexible, and you can change the filter media to meet your needs. Read our reviews about canister filters, and then figure out what style of unit will work the best in your unique aquarium setup. Look for versatility and reliability from your filter; when you do, you’ll find a canister filter that will last you a lifetime.